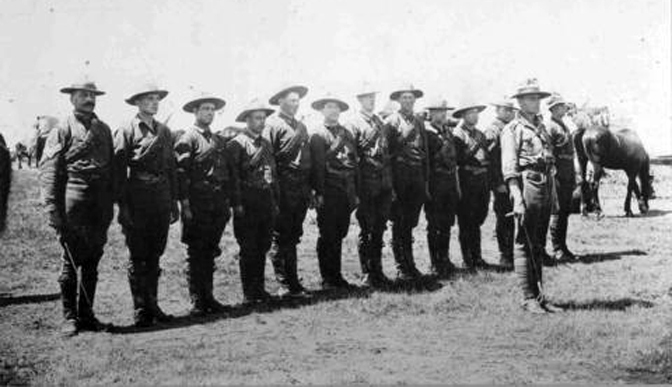 In 1907, the Red Deer’s first militia unit, an independent troop of the 15 Light Horse, was formed. The creation of a permanent presence for the militia in Red Deer was greeted with great enthusiasm. The troop grew so rapidly that it was soon expanded into the Red Deer Independent Squadron of the 15th Light Horse. 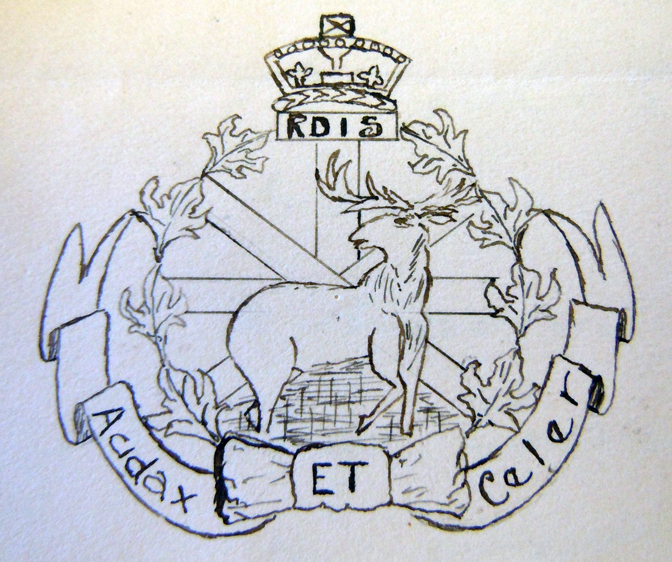 On April 5, 1911 the District Officer Commanding (DOC) Military District 13 (MD13) submitted a badge design for the Red Deer Independent Squadron of Light Horse. The design sketch is long missing but we know that both cap and collar badges were identical in design but differed in size, with the cap being 1.5 inches high and 1.25 inches wide, while the collars were 1.25 high and 1 inch wide. The badge was to be of gilding metal. It can be inferred from later correspondence that the proposed badge lacked a motto. Three months later the Commanding Officer of the squadron, Major Harold L. Gaetz, was asked to explain the significance of the badge in order to advance the proposal and publish the design in Dress Regulations. Regrettably, Major Gaetz was not forthcoming. In fact, Gaetz was the subject of eight separate letters from the DOC MD13 to which he did not reply. Hand drawing of the badge from the Archives files. Circular wreath [of] maple leaves, on ribbon scroll on which is inscribed Regimental motto ‘Audax et Celer’ (Bold and Swift). The top of the wreath joined by straight bar on which is inscribed the letters R.D.I.S. the whole surmounted by Tudor crown. The wreath surrounds a Union Jack, in the foreground is a Canadian Red Deer standing in water. The badge was to be in gilt with the stripes of the Union Jack, maple leaf wreath and letters in silver. Notwithstanding the approval, there is no indication that a badge was ever produced. Postscript – The final document on file has two hand-written minutes, both undated. One refers to an amendment to Dress Regulations while the other effectively closes the file, not just on the badges but on the entire squadron; “This independent squadron is now merged in the 35th Central Alberta Horse.” This Alberta unit was formed in 1913 with headquarters at Red Deer and squadrons at Red Deer, Pine Lake and Wetaskiwin.